Hello there! How has your week been? This week has been my last full week at home before I return to Sheffield and it's been a busy one! Last Saturday night I went with Lisa and Belinda (who I work with) for a meal out to Cleones in Halesworth. I had never been here before, but it is a little Italian restaurant that is attached to The Angel pub. The last time I had been to Halesworth was probably about 3 years ago, so it was nice to go out for a meal somewhere that we wouldn't normally go to. I really enjoyed being back at work again over the summer and was really sad to leave, so this was a nice way to end it. Here we all are with Lisa pouting haha! I went away with my parents for another trip in the Caravan to Woodbridge this week. We were expecting horrible cold weather, but luckily it was bright sunshine! I had only properly been into Woodbridge once before when I was little to the boating lake, so it was nice to actually have a proper walk around. We took a short walk to the mill and from here we went on what we thought was going to be a mile walk to a pub. It turned out that the man in the mill had underestimated how long it was and after walking about a mile and a half, with no pub in sight, we gave up and walked up to the main road to discover that we had actually walked out of Woodbridge altogether! After having a stop for something to eat at the pub that we found there, we walked back along the main road and into the town. Although we didn't really know where we were going on this walk, it was such a beautiful day, and the river was sparkling in the sun. I had a really nice time away with my parents, and it was a good time to go away the week before I go back to Sheffield. Hello there! Today's post will be another recipe that I would like to share with you. It comes from an old children's cookbook that I have from when I was younger, which is called Kids in the Kitchen and is by Sara Lewis. It wasn't a very nice day outside, and we were in need of something to have for lunch, so I thought that I would make an old favourite of mine which is a cheese and chive bread. Although it is described as a bread in the recipe, it is actually a scone like consistency. It is really quick and easy to make, so if you want something homemade for lunch, or to take to a friends, this is great! -The first thing that I did was grate the cheese into a small bowl. You can then cut up the chives with a pair of scissors and mix this together. -In a large mixing bowl, put in the flour with the salt and pepper. -Add the grated cheese and cut chives to this and mix together. -Beat the egg in a cup/mug and add to the mixture, but leave enough to brush on the top at the end. -Add the mustard and then using a wooden spoon gradually mix in the milk to make a soft but not sticky ball. The recipe calls for 150ml of milk, but I only used 100ml and found that actually I needed to add a bit more flour so the dough was the right consistency. -Preheat your oven to 200°C/400°F/Gas Mark 6. As my oven heats up quite quickly I only needed to turn it on here, but if yours takes ages to get to the right temperature, you will need to do this a few steps back. -Once your mixture is in a ball, sprinkle your work surface with flour and knead the dough. I thought that you would need a rolling pin, but reading on I discovered that you just have to 'pat' it into a circle about 18cm wide rather than actually rolling it. -Cut this into six segments and space them apart on a baking tray. -Now it's time to bring back that egg you've been saving as you need to brush the top of the rolls with it. -Bake in the oven for around 15 minutes or until they have risen and are golden. If you have a go at making them, please email me a picture, or tweet me @jesslouisekeen! Hello there! How has your week been? My week started off well, but then went a bit down hill when I caught a cold! Touchwood I am a lot better now though. On Sunday I went to Pleasurewood Hills, and if you missed my last post you can read all about it here. This was a really fun filled day, and I hope we can all go back again next summer. On Monday I met up with my lovely friend Kirstie in Norwich, where we had a spot of lunch and did some shopping. Shopping wise we both found it a bit disappointing as there's all the ends of the summer lines with the beginnings of the autumn ones, meaning there wasn't collectively anything we really wanted. For lunch we went to The Waffle House, and if you are ever in Norwich be sure to check out this place! 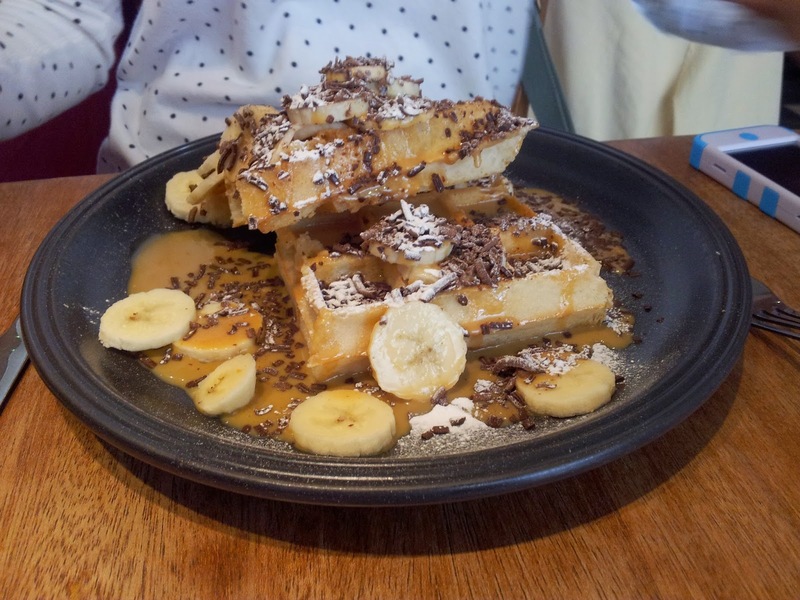 You can pick between savoury and sweet waffles, (I know what you're thinking- eugh savoury waffles?! 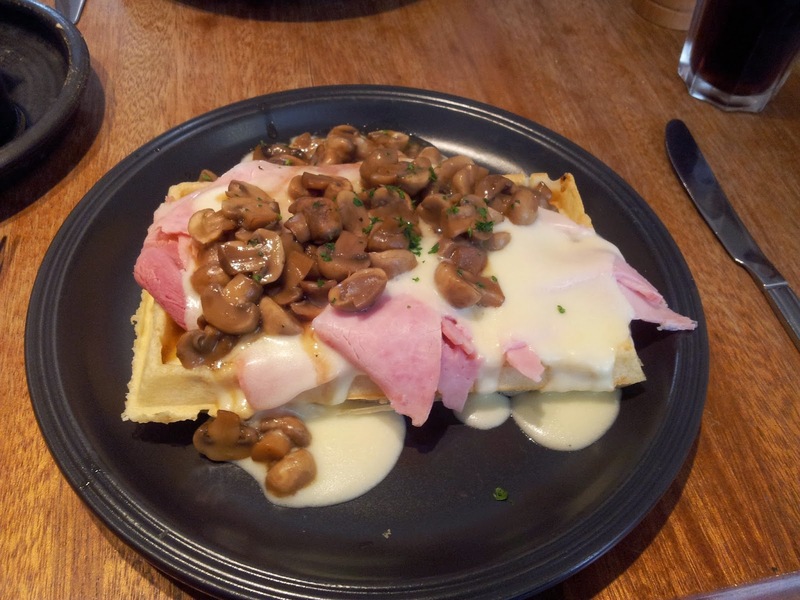 But it's more like having it with bread than with the type of waffles that you are probably thinking of) and I went with the ham, mushroom and cheese sauce one, whilst Kirstie had the banoffee one. Every time that I come here, I never leave disappointed. You can choose whether you would like a small or a large one (we both went for large!) and what is also really nice is that they do a student discount. Somewhere in-between Monday and Thursday I caught a cold, and I had to take a day off work yesterday. Luckily today I am feeling a lot better in myself and so my mum and I went to a local cafe called Busby's Tea Hive and it is so cute in there! I have been in before, but only whilst at work to collect take away sandwiches, and I thought it was time I went and properly sat in there. Every day on their Facebook page they upload photos of all the scrummy cakes that they have on offer and we knew that we needed to go in there for lunch before I went back to Sheffield! You can see from these photos just how much effort has gone into the decor and there was such a lovely atmosphere and the staff were ever so friendly. To drink, my mum had an Ice Cream Soda, and I went for the Cola Float. They were served in these coloured mason style jars, and I really want to get some to use in the new house! To eat, I had a mature cheddar, tomato and onion chutney toastie, whilst my mum went for a smoked salmon and cream cheese bagel. Unfortunately we were both full up after this and so didn't get to try any cake! We will definitely have to go back again for afternoon tea one day. Hello there! On Sunday a few friends and I went to 'Pleasurewood Hills' which is the local theme park. We were supposed to go the Sunday before, but owing to the weather we put it off and luckily it stayed dry enough for us to go this time! Hello there! Have you had a good week? I myself have had a very busy one. 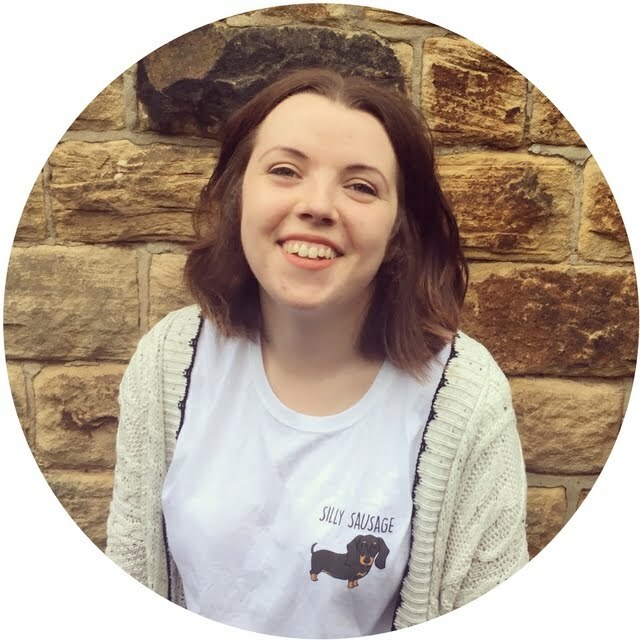 I had an unexpected chill day on Sunday as I was meant to be going out with a group of my friends, but due to the weather we had to call it off and are trying again tomorrow! This proved to be somewhat beneficial as I was able to have a spring clean of my room (although in summer I know!). This may not sound like fun, and a few years ago you wouldn't have found me doing this, but after having moved away to Sheffield I have become a tidier person. I had a good clear out and now my room looks (somewhat) neat and tidy! On Monday I had an appointment at the opticians, again not too exciting but I was told that I had 20/20 vision so that's really good. My parents took a trip away to Liverpool for a couple of nights so Tommy came round to keep me company. 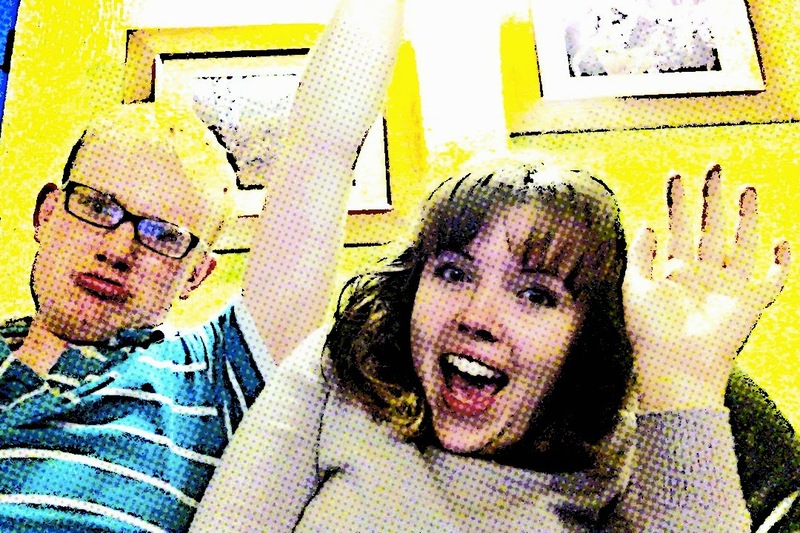 We had a lovely Skype call to our friend Megan who we haven't seen since the middle of June and previous to this we had been playing about with Photo Booth on my laptop. This one is alright- there's a lot with us having bug eyes which the internet will never see! After work on Thursday I Skype called Reesha, and the last time I had seen her was in Leicester and if you missed my post about it, you can read it here. I don't know why we haven't Skype called before! I only have another 2 1/2 weeks until I return to Sheffield, and this was the first time I saw them face to face. It was so lovely but made me miss my Sheffield friends more. This however is making me appreciate my last two weeks at home, as I know pretty soon I will not be returning for a while. When my parents were staying in Liverpool, they went to an exact replica of 'Central Perk' from Friends. If you didn't already know, I simply love Friends and I am so jealous that they got to go! I have added it to my list of places that I want to visit in the UK. 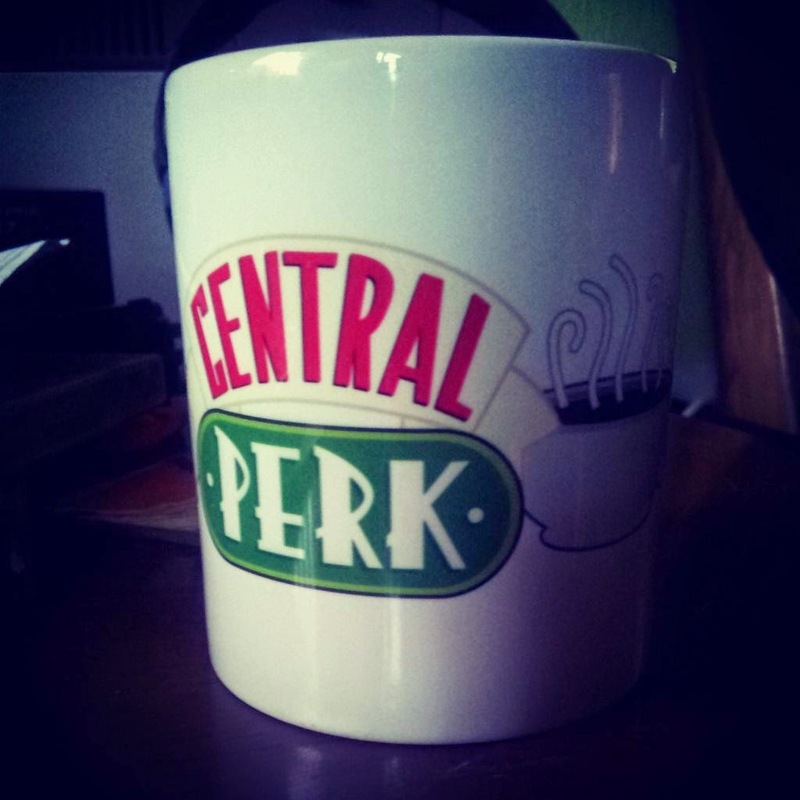 They did kindly bring me back a Central Perk mug though. Hello there! Following on from my 'How To: Mushroom Puff Pasties' post here, today's post is another recipe! This time it is a baking one. I found the recipe for these red velvet cupcakes in Everything Alice by Hannah Read-Baldrey and Christine Leech. This book is really good, it contains recipes along with other crafty ideas all with the theme of Alice in Wonderland. I would say this recipe could be used for a special occasion, or if you have quite a bit of time on your hands. I wouldn't suggest trying this if you only have a spare hour or so as there's quite a bit to it! -Preheat oven to 180°C/350°F/Gas Mark 4. Place cases into tin. 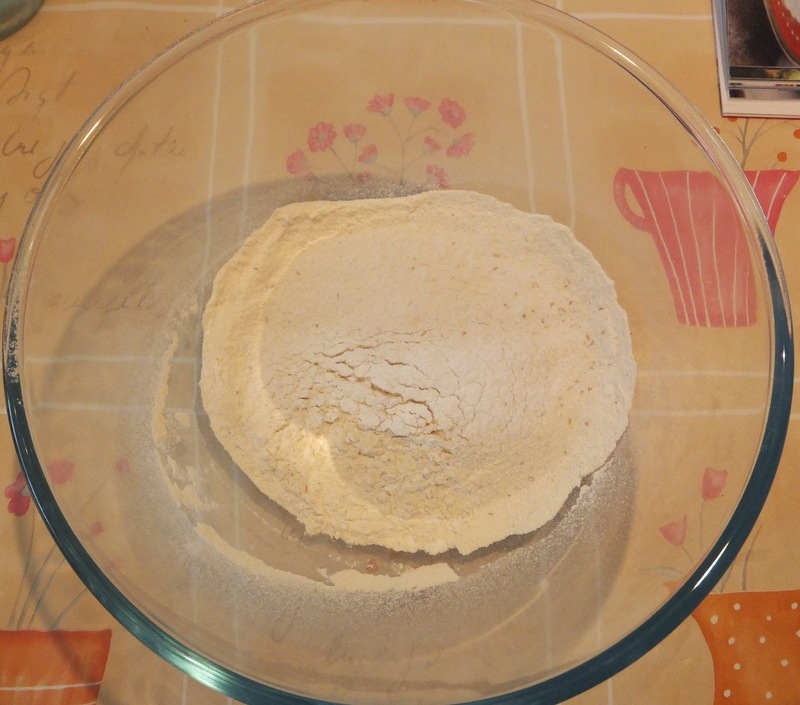 -Sift the flour, baking powder and salt into a bowl and set aside. -In a small bowl combine the cocoa powder and food colouring and blend together until thick, shiny and with no lumps. -Cream the butter and sugar together in a separate bowl. -Slowly add the egg, then the cocoa paste and vanilla extract. Mix until smooth. -Add sifted flour and sour cream/buttermilk, stirring in alternate spoonfuls until the mixture is well blended. In a cup mix the vinegar and baking soda and combine this with the cake mixture. -Spoon the mixture into paper cases. Bake for 20 minutes. -Once cooled, you can make the icing. Mix the butter (softened) and icing sugar together. I added a few drops of the red food colouring to make the icing pink! If you need more liquid add a drop of milk. Ice the cupcakes, I find using a teaspoon is best as you can swirl it round the whole cake well. I really enjoyed making these cakes but they were a bit tricky! I wouldn't use this recipe all the time, but I would make them again for a birthday or something. If you have a go at it please tweet/email me a picture!